Hold the phone... for our huge Summer Camp Guide! + Dozens of spring and Easter festivals for OKC family fun! Friday | April 12 | Mitch Park Amphitheater Starts at Dusk Admission is free, concessions are $1 each. Offer to be used on or before 6/25/19. Must mention promo code LMJA19 at time of booking. Excludes online bookings. Birthday party must be held by June 25, 2019, in order to redeem offer. Offer not valid on holidays or with any other offer or discount. Reservations required, 10 child minimum. Certain restrictions may apply. *Gravity Ropes and Laser Tag have a height requirement of 48” to play. Grapevine, TX, a trip for four valued at $800. our website for our popular lists featuring local farmers markets, street festivals, Earth Day festivities and Easter happenings. All of these and more can be accessed at www. metrofamilymagazine.com/springfun-guides. Sponsored Content: New weighted Manimo plush animals provide comfort and a deep therapeutic effect for children with ADD, ADHD, ASD, anxiety or other disorders. Learn more at www. metrofamilymagazine.com/toyswith-benefits. These unique stuffed animals are available at learning tree toys, books & games. ll it takes is one person or one unique experience to set a person on a different, better path. Perhaps you’ve seen this phenomena happen in your own life or for someone you love. Years ago, my then middle school daughter asked to take a summer day camp to learn HTML. This was not long after the introduction of the internet to the mainstream population so although we already had a computer at home, it still seemed a strange request. After the two-week camp, she spent the rest of her summer creating a website of her own about interior decorating for teens. Now she is a top vegetarian cooking blogger in the country, writing, creating and influencing millions of others with her blog posts. I’ve been inspired through the years of stories of those who were angry and lost as children or youth but when one caring adult showed up in their lives and encouraged them, it made all the difference. Whether it was a teacher, coach, youth leader or other mentor, they helped these kids become aware of a different future and find hope when perhaps they had none. 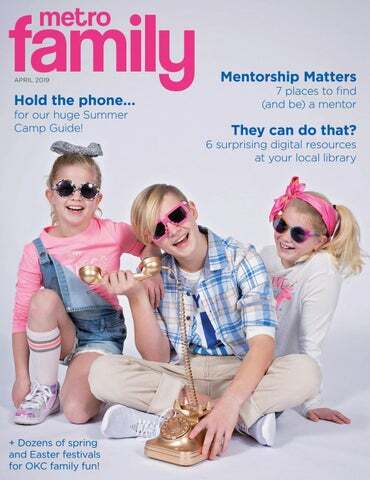 You’ll find plenty of summer camps that can inspire your child to try something new starting on page 46, and you’ll likely be as inspired as I am in reading about the value of mentorships and knowing where local kids can find quality mentors on page 16. Our foster care series continues this month with an amazing story of mentorship and redemption between a foster family and a biological family, culminating in a better situation and stronger relationships for the children involved. We hope you find what you need in this April issue to help your kids spark an interest that benefits them for a lifetime. And that you are inspired to find help or be the help as a mentor locally to someone who needs you. Blessings, Sarah, Publisher PS: We’re happy to announce that editor Hannah and her husband welcomed a healthy baby girl into the family in late February. Congrats to all! This Month’s Cover Elin (7), Ava (10) and Gabriel (13) appear on this month’s cover. Elin loves to dance and takes ballet lessons twice a week, but her favorite activity is loving on the family’s puppy, Max. Ava loves to sing and performs with the Edmond Fine Arts Institute. She has an upcoming role in their production of “The Secret Garden.” Gabriel is a class clown and was voted Most Dramatic at school last year. He’s also the first chair bassoon player at Central Middle School. Baskets, Bunnies and Fun, Oh My! Easter celebrations for every member of the family. Babies & Toddlers Squeeze in some post-naptime fun at The Easter Carnival at New Covenant United Methodist Church on April 13. Kicking off at 3 p.m., families can enjoy food, bounce houses, train rides, a petting zoo and more at this community carnival. Sam Noble Museum hosts families for a fun evening of celebration on Wednesday, April 17 from 4 - 7 p.m. At their FREE Eggstravaganza, little ones can enjoy spring themed crafts, face painting and games, followed by age-divided egg hunts to round out the fun. And, the Easter bunny will also be there! Add some variety to your festivities and attend one of the many exciting events Oklahoma City has to offer. Be inspired by these ideas for every age and stage and find even more on our calendar starting on page 18.
pose for pictures with costumed characters, cuddle with real live bunnies and race to collect a basket full of eggs. There will be 60,000 eggs filled with treats and prizes and some lucky hunters can win bikes, iPads and more. Celebrations begin at 9 a.m. and the hunt kicks off at 11 a.m. Teens If your teen thinks they are past their egg hunting days, the Egg Hunt 5K just might change their minds. Eggs are scattered along the course and each egg holds fun prizes including tickets to popular sporting events and gift cards to local retailers. Kids 12 and under can tackle the half-mile course also lined with goody-filled eggs. The race takes place at Stars and Stripes Park on Saturday, April 13. Registration to the 5K is $35 and half-mile Kids Bunny Hop is $5. Sign up at parks.okc.gov. Families can also lace up their sneakers the following Saturday and race in the annual Easter Run on Saturday, April 20 benefiting The House of Healing, a non-profit organization that mentors teenage girls. 10K, 5K and a one-mile options are available. Find more details about these events and much more at www.metrofamilymagazine. com/easter. COMING SOON! NEW YUKON LOCATION. Call (405) 840-1686 NOW to schedule an evaluation! We help growing families flourish. > Prioritize and pay down debt. > Save for college and family vacations. Our therapists provide fun, inventive and playful interventions that address your child's specific needs. We offer physical therapy, occupational therapy and speech language therapy. Investment Services®, Member FINRA/SIPC, Advisory services offered through HD Vest Advisory Services®, Insurance services offered through HD Vest Insurance Agency, LLC. Wymer Brownlee Wealth Strategies is not a registered broker/dealer or registered investment advisory firm. Like most parents, Morgan Stidger worried about what her child watched or played on her phone and computer. But then she learned about a program at the Oklahoma City Metropolitan Library that could help. While at a toddler playtime, she was told about a digital learning site called Speakaboos, offered free with her library card. “My son took to it very quickly and easily. It is easy to use and I don’t mind him playing it because it helps with his speech delay,” Stidger said. “My son has had intense speech therapy for two years but as soon as he started using Speakaboos, he was attempting to sing along with the songs.” While many parents are anxious about their child’s relationship with technology and what quality entertainment they are exposed to, the Metropolitan Library System has a slew of free digital learning resources designed to support learning and literacy. Katherine Hickey, the children’s librarian at the Metropolitan Library System, said a simple library card can open a whole world of entertaining digital sites that also support learning and child development. “We have services for the early childhood crowd as well as the elementary age and middle school kids,” she said. “I think the library is still perceived as a repository of books, so if someone isn’t frequenting the library on a regular basis, I think it could be really easy to overlook all of our digital services.” Hickey shared some of the best learning services offered to families and children available at the library, all free with a family’s library card. Parents should follow the instructions because if they go directly to the app store, the service will not be free. Speakaboos was developed by a team of educational researchers to meet the developmental goals of kids, Hickey said. Speakaboos can be accessed at www. metrolibrary.org/speakaboos. sentences are broken down into easy-tounderstand parts and are reinforced through repetition by native speakers. “For elementary-aged kids, what we have to offer at this level is homework help,” Hickey said. “We do offer subscriptions to databases that schools don’t necessarily have a subscription too. This is where we can really offer something special to the kids to supplement what they’re doing in school.” For children doing reports or essays, Britannica for Kids is an online encyclopedia written just for children in fun colors and a layout that is easy to navigate. “I don’t know if you’re like me and you had a big set of Britannica encyclopedias growing up. That’s all online now and so we have the Britannica library for children and we also have it for young adults, so it’s an encyclopedia that’s written at the reading level of kids,” Hickey said. All the learning databases available at the library can be accessed through metrolibrary.org/research. National Geographic for Kids not only has beautiful videos and pictures but reference level content as well. Viewpoints in Context Opposing Viewpoints in Context is a digital learning site that helps children think through complex social issues by presenting both sides of an argument. From capital punishment to immigration to women in combat, this cross-curricular research database supports science, social studies, current events and language arts classes. The informed and differing views help learners develop critical-thinking skills and draw their own conclusions and is a great resources for children in debate classes or writing critical essays. “The program provides a summary and presents a list of articles from different viewpoints that argue different things,” Hickey said. “It’s really helpful if kids are arguing one point and they really want to understand what the other side believes. It’s super easy to read because it’s meant for a younger audience. Culturegrams Perfect for students who have to write essays or learn about different countries and cultures, Culturegrams goes beyond basic facts and figures on more than 200 countries, with up-to-date reports detailing daily life and culture, history, customs and lifestyle from an insider’s perspective. “This is really helpful to teach a global perspective. So a lot of kids come into the library and they have to do a report on a certain country and this is where we always start,” Hickey said. “You can click on whatever country you want to learn about and it’ll present a profile of that country with a description of the culture, of the economy, of social issues and all the basic information like the flag and the population.” The kids’ edition of Culturegrams has a collection of more than 185 country reports, complete with images, an historical timeline, fun facts and sections on history, population, “life as a kid” and more. “If your child is writing about a country or about a culture, this is another great resource. But what I really like is that it has all of the magazines and the books you can read online,” Hickey said. “So if it’s 10 p.m. and your kid won’t go to bed and says ‘I want to read another book about dinosaurs’ and you’ve already gone through your entire collection, you can come here and find a book about dinosaurs and pull it up on your tablet and read it.” The program has all of National Geographic’s award-winning magazines, books, apps, games, toys, videos and events on its website, and is the only kids brand with a world-class scientific organization at its core. Hickey said that while many of the learning resources open to families are usually subscription based, the Metropolitan Library allows access for free. “The library is a public asset and exists to support the information needs of the people in its community. So really the people of Oklahoma City have already paid for this through their taxes,” Hickey said. “We want to be good stewards of their taxpayer dollars and provide really high quality resources. The role of the library is to ensure that everyone, regardless of their economic status, has the potential to learn what they want to learn about.” All the programs are available at metrolibrary.org/databases, listed alphabetically. Stidger said both she and her child have grown in vocabulary, thanks to the Speakaboos program offered at the Belle Isle Library. “Everyone I have told about the free resources doesn’t know about it, but they seem excited for some useful screen time,” Stidger said. “I would urge parents to try it for themselves and see how they like it. My kids really like to play on my phone while I workout and I feel better about them playing Speakaboos than watching mindless shows.” For more information about all resources for kids, visit www.metrolibrary.org/ children. BEYOND Nuggets & Fries One mom’s recommendations for adventurous kid meals in OKC BY MAGGIE MURDOCK NICHOLS. PHOTOS PROVIDED. Family Style Some restaurants don’t have a kid’s menus and I don’t fault them for it! Selecting a meal to share as a family is a great way to get buy in from everyone at the table. Local We prioritize eating local food and supporting local people! We’re rarely disappointed with local dining experiences. Nutritious I applaud restaurants who are unwilling to waive standards on their kid’s menus. Eating outside of the home is a great place to introduce new foods. The novelty of the whole experience may encourage kids to chow down on something new and nutritious! Authentic Ethnic food really takes the cake for a variety of flavors and textures. One of our daughter’s first favorites was kimchi. Meals become an experience when the whole family is offered food within the same genre of that restaurant’s specialty. Hold the chicken nuggets please! Cheap Ideally, kid’s meals are always cheap. I’ve noted meals that are under $3 or free. Spend Summer At The Sooner! Acting, Singing, Dancing, and a little MAGIC! SCOUT Girl Scouts are Go-Getters, Innovators, Risk-Takers and Leaders. Cathy Ferguson (pictured above) competed in the 1964 Olympic Games in Japan and brought home a Gold metal. Pho Lien Hoa With quick service and lots of activity, this is a great place for kiddos. They offer a kid’s portion and are always careful with hot broth around kiddos. Ask for scissors to cut the noodles. Located near the Gold Dome off N.W. 23rd Street. Join a network of girls who aren’t afraid to take risks and take action! times I am finally up at 6:15. I spend time giving gratitude and praying before starting my day. I am a big fan of KOCO in the morning so it is on throughout the house as I prepare for the day. 6:30 a.m. I drink a cup of hot water as soon as I am up and moving around. Depending on my schedule, I will either do a few exercises at home, tidy up the house or immediately start getting ready and packing lunches. to snooze a bit so I give him five-minute increments until he is finally up by 7:00. Since I either work from home or rotate my time between offices, his wake-up time depends on where I have to be. home, this is the time we are out the door. He gets to school (Heritage Hall) between 7:45 and 8 a.m. and then I am off to an office for a visit or back home for conference calls. in with pain and our doctors and team members can provide relief by taking care of their dental needs. My day will wrap up by 5 p.m. or sometimes later if I have a business dinner after work. Most days my Mom will pick my son up from school. On the rare occasion I can pick him up is a highlight for us both. pick up my son. She is my lifesaver and as a single mom, I could not have the career I do without her support. and I immediately change clothes and spend a few minutes relaxing and talking about our day before he starts homework and I start dinner. My evenings consist of dinner, housework and working on Mojo Original. Twice a month I host Facebook Live “Mojo Talks” focused on personal and professional growth. Other days, I am working on my book, additional training content, calls with clients or relaxing and watching TV. Besides homework, my son spends his evenings taking care of the geckos he breeds and sells or interviewing someone for his podcast PBR Talks. His two favorite things are geckos and bull riding. we are usually down for the night around 10:00 p.m. He watches an episode of “Golden Girls” and I will catch a recorded show before finally falling asleep. BY ERIN PAGE. PHOTOS PROVIDED. Why Mentor Britanie Ramirez, director of Whiz Kids Oklahoma, sees that impact every day. Approximately 73 percent of fourth grade students in Oklahoma read below proficiency level, according to Whiz Kids, and Ramirez says whether students can pass their third grade reading test correlates to what they can accomplish in their futures. participant as a sales coordinator for the organization’s REAL Kitchen company, which created and sells salsa to stores around the metro and is now mentoring younger students. “Seeing the life change in our students and their eventual desire to give back and pour into younger students restores my hope in the future,” said Hirsch. Matt Hankinson, director of Youth for Christ Oklahoma, challenges potential mentors to think back on their own awkward teen years to the person who believed in and supported them. Though Hankinson says his parents were top-notch, it was his own mentor, Terry, who showed him that he could live a clean life and still have fun. Many Whiz Kids volunteers have been active for decades, with some staying connected for years after the program, attending kids’ graduations and weddings. “He was an outside voice speaking wisdom to me,” said Hankinson, who believes everyone is called to mentor and share life with young people because it allows all parties to grow. Brent Wheelbarger, CEO of Trifecta Communications, brought his expertise in emerging technology to Loveworks Leadership students for a week during an experiential learning camp. Not long after, his team decided to make the experience longterm, interviewing and selecting students to become part of their start-up business creating augmented reality wristbands. Shawn Johnson, Youth for Christ campus coordinator for Douglas middle and high schools, says many potential mentors overthink it, feeling they are too busy to develop a relationship with a young person. Classes offered in ballet, tap, jazz, hip hop, jazz funk, improv, contemporary, stretch, strengthen and music theater. 405-242-4612 1217 E. Hefner Rd. The J. D. McCarty Center for children with developmental disabilities conducts FREE therapeutic screenings of children who have unique challenges or a disability, or for parents who have concerns about their child’s development. Our screening team is composed of a pediatrician, nurse, social worker and psychology clinician. When the team has completed their screening process they will sit down with you to review what services are available for your child here at the McCarty Center as well as through other community, state and federal programs. Today, more than ever before, we are an important resource for Oklahoma parents. We have been working with children for 72-years to help them achieve their highest level of function and independence. The screening is absolutely free-ofcharge. Call 405.307.2800 and ask to speak to a social worker for more information and to make your appointment. • 3 x USASF World Champs! • 3 x Summit Champs! BISON TALES April 6 10:00 a.m. – Noon Hear intriguing tales about bison and create a craft to take home. Stories begin at 10:15, 10:45, 11:15 and 11:45 a.m.
ALL-DAY PASS *In-Park purchase only. Does not apply online. ATTRACTI ONS FOR 2019 ! If your child struggles to read, write, or pay attention, it could be a learning difference. Trinity School’s mission is to provide a safe and nurturing educational experience for children with learning differences through programs designed to meet each student’s specific needs. It takes four weeks to go from egg, larva, pupa to adult. And in one magic moment, a scientist is born. SEE BALANCED LEARNING IN ACTION. CALL FOR A TOUR TODAY! Primrose School of Edmond 15000 N. Western Ave. Edmond, OK 73013 405.285.6787 PrimroseEdmond.com Each Primrose school is a privately owned and operated franchise. Primrose Schools® and Balanced Learning® are registered trademarks of Primrose School Franchising Company. ©2017 Primrose School Franchising Company. All rights reserved. See primroseschools.com for ‘fact’ source and curriculum detail. Swim Lessons at Goldfish are for ALL Kids! For parents who have children with special needs, it may be difficult to find a recreational, physical and meaningful activity that focuses on your child’s ability rather than their disability. Swimming is an ideal activity because it can showcase special abilities or hidden talents in each student. Our small class sizes allow your child to receive individualized attention and develop fine motor skills while improving social skills and having fun! MAKE A SMOOTH MOVE. Freeze smoothie packs ahead of time to make snack time a breeze. Less prep time means more time to chill out. Store active wear in your car in case an adventure pops up — like a trip to the park! Sell. Buy. Repeat. SELL THE TOYS, CLOTHES AND EQUIPMENT YOUR KIDS HAVE OUTGROWN FOR CASH TODAY. SAVE ON THE BRANDS YOU TRUST WITH OUR EVERYDAY LOW PRICES! ling & S 1/2 Price Bow se. Every Open to Clo Monday! Ask about our party packages! Preservation Oklahoma is proud to advocate for the places where Oklahoma history lives. Oklahoma City is full of rich history with iconic structures that are worth saving. WIC or Women Infants & Children is a USDA Food and Nutrition Service federally funded supplemental feeding program administered by WCD Enterprises, Inc.
Why not call to see if your family qualifies? Visit www.wcdwic.org for more information. USDA is an equal opportunity provider and employer. when you’re one in a million? Book a Free Field Trip for your school, church, or day care today! Find more information about these exhibits and other current museum exhibits at www.metrofamilymagazine.com/museums. Jennifer and Evan Brown have more than 30 total years of experience working for the Oklahoma Department of Human Services, and seven years experience as parents of a daughter, but nothing could have prepared them for the sound of their foster sons, ages 5 and 6, sobbing uncontrollably at bedtime. In a moment of desperation, Jennifer recalls starting to sing “Hush Little Baby,” which she can’t remember ever having sung before. The littlest brother stopped crying and looked at her incredulously. “He said ‘my mom used to sing that to us,’” said Brown. “I realized how much they missed their mom and that they deserved to have contact with her.” When Brown talked with the boys about their parents and their initial removal from their home, they recalled how much they and their mom cried. Having witnessed many removals in her time with DHS, Brown says that’s not always the case. Knowing the trauma the kids endured in being removed from their home, the subsequent unplanned movement from their first foster home and separation from their sister, the Browns felt regardless of what permanency would look like, they needed to see their parents. Though the case was heading toward terminating parental rights with no contact, the Browns wanted to develop a relationship with the biological parents, amidst advocating for the speech and trauma therapies the boys needed, keeping them connected to their sister in another foster home, working with their schools to determine academic standings, managing often challenging behaviors and ensuring their daughter was getting the attention and counseling she needed. Let us take the journey alongside you. Railene is the first to admit that, like all parents, she has made mistakes. “They made us feel really comfortable and like their home was ours, too,” said Railene. “The visits are like we are all a family.” Railene loves getting to bathe and put her boys to bed. Everyone participates in household chores, sometimes they all cook together or occasionally go on an outing, but the Browns also give the boys’ parents the space and affirmation to parent their kids themselves. The team of four parents work together to determine the best parenting methodologies for the boys. “When it comes to discipline or anything, we all have an input and agree together on what we should do,” said Railene. When behavior charts aren’t fulfilled or there are complaints about brushing teeth, Brown reports that to Railene who discusses it with her boys over the phone or during a visit. Railene says Brown is in contact with her throughout every day, letting her know about illnesses, upcoming field trips or behavior issues at school. This is one part of a year-long series highlighting foster families in the Oklahoma City metro. 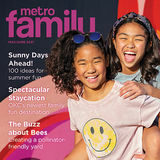 For more, visit www.metrofamilymagazine.com/foster. INDUSTRY-LEADING BENEFITS – THAT’S THE KIMRAY WAY. New sights and old favorites in the DFW area BY ERIN PAGE. PHOTOS PROVIDED. Whether for a quick weekend getaway or a weeklong adventure, the Dallas-Fort Worth area offers a host of fun for kids of all ages, just three hours south of Oklahoma City. Peruse the possibilities for both tried-andtrue activities and attractions, newcomers and a few quirky additions. On The Way At Bedre’ Fine Chocolate’s Manufacturing Facility in Davis, Okla., watch through floor-to-ceiling windows as confections are produced and packaged. Taste-test samples, purchase favorites individually or in pretty packages, take advantage of nice restrooms and burn some energy at the outdoor playground. In Gainesville, feed the flamingos, watch the big cats, giraffes and bears, ride a tiny train and stretch legs at the large community playground at Frank Buck Zoo, or tour Circle N Dairy to bottle feed calfs, milk a life-sized cow simulator and sample milk products. Stay Everything’s bigger in Texas, and that includes the Gaylord Texan Resort in Grapevine. Boasting 10 restaurants, indoor gardens, oversized board games, two pools and running trails, this resort alone can keep the whole family entertained for a long weekend. Don’t miss Paradise Springs, the outdoor water park, free for guests. The park is small, making it easy to keep up with multiple kids, without feeling overcrowded. A multi-level play structure, splash pad and small slides are perfect for young children, a winding lazy river is fun for all ages, and the large family lagoon offers waterslide and zip line adventure for older kids. The onsite bar and grill will deliver straight to your lounge chair. Other favorites: The Hilton Anatole features Jadewaters which is an extensive resort pool area with water slides, lazy river and kids splash zone, and Gepetto’s Marionette Theater showing childhood favorites like “Jack and the Beanstalk” and “Peter Pan.” And the Omni Dallas has a rooftop pool and hot tub offering beautiful views, especially at night. a stash of gold. Rest your legs, grab a bite and enjoy the jungle and extensive menu offerings at the Rainforest Cafe, also in Grapevine Mills Mall. Tiny conductors will love the Grapevine Vintage Railroad, in historic downtown Grapevine, offering hourlong to half-day routes in 1920s Victorian coaches on Saturdays and Sundays. Whether via the Grapevine rails or on your own, at the Historic Fort Worth Stockyards, catch the twice-daily cattle drive, puzzle your way through the Cowtown Cattle Pen Maze, and love on livestock at the petting zoo. Nearby Joe T Garcia’s Mexican Restaurant, started in 1935, serves handmade tortillas and enchiladas in casual but beautiful indoor and outdoor dining rooms (expect a wait and bring cash as credit cards aren’t accepted). Familyowned Kincaid’s Hamburgers is the place for a burger, or Angelo’s will satisfy barbecue cravings. After dinner, pair the lightness of shaved ice with the creaminess of ice cream at Lumi Snow, whose creative, towering concoctions boast flavors like campfire classic and breakfast trash. Other Fort Worth favorites include the Kimbell Art Museum, with free admission to the Kimbell collection, sensory-friendly play space for kids 5 and under and drop-in studio art projects for families with kids 12 and under, and the American Airlines CR Smith Museum, where pilots-to-be learn how an airline works through interactive, kid-friendly exhibits. Cap off a cultured day at Coyote Drive-In, showing double features nightly. TOP: FORT WORTH STOCK YARDS. RIGHT TOP: TEXAS DISCOVERY GARDEN. RIGHT MIDDLE AND BOTTOM: DALLAS ARBORETUM AND BOTANICAL GARDEN. watch longhorn, donkeys and even buffalo and zebra graze its 8 acres, get your car washed for free and check out the impressive collection of taxidermy. Indulge your sweet tooth at Cake Bar, serving Southern-style scratch-made cakes, cookies and ice cream, the perfect way to celebrate your crazy fun trip to DFW. What’s It Like to Go to Camp? On page 46 of this issue, you’ll find our annual Summer Camp Guide. A savior for local parents, the guide outlines top summer camp opportunities for kids in a huge array of themes, activities and regions. But just because you find a good camp doesn’t mean your kids are going to want to attend. Going to summer camp for the first time can be intimidating for both parents and kids. So this year, we asked a handful of local kids who’ve been to camp about their experiences to help ease some jitters beforehand. Here are their thoughts. What was your favorite part of camp? I liked horseback riding, hiking through rivers and kayaking. Least favorite part? Being up late and coming home. It was so much fun I didn’t want to leave. Did you learn anything that surprised you? You get soaking wet while kayaking! Do you want to go back to camp? Yes, I had so much fun. I want to do it all again. Best advice for other kids? It was hard to be away from home the first night but it gets better. What was your favorite part of camp? I enjoyed really good food, horseback riding and mountain climbing. Least favorite part? Cutting owl pellets was gross and it rained a lot before we went and while we were there. Did you learn anything that surprised you? I learned about snakes and ways to tell if they are poisonous or not. Do you want to go back to camp? Yes, it was really fun. I got to do a bunch of stuff. It was just plain awesome. Best Advice for other kids? Keep your head down when hiking so you don’t bump your head. What was your favorite part of camp? Making new friends and there were a whole bunch of activities to try. Least favorite part? In Camp Classen, we had to sleep during the siesta time each day. In Camp McFadden there were big breaks between activities. Did you learn anything that surprised you? In Camp Classen, the cabins had freezing air conditioning. I didn’t know that we were going to shoot BB guns in Camp McFadden. Do you want to go back to camp? Yes, I would like to go back to Camp McFadden again or even try a new camp. What was your favorite part of camp? Archery, roasting marshmallows, tie-dying, swimming and Counselor Hide and Seek. Least favorite part? Bedtime! I didn’t want the fun to end. Did you learn anything that surprised you? How fast I made friends. Do you want to go back to camp? I can’t wait! What was your favorite part of camp? We got to do different simulated missions. My favorite simulated mission was we went to one of Mars’s moons and did some experiments. Least favorite part? Having to come back home. Did you learn anything that surprised you? Yes. I learned that somewhere, a moon’s name was Enceladus. Reminds me of enchiladas! Do you want to go back to camp? Yes, I am going back next year to the robotics camp there. What was your favorite part of camp? I really enjoyed participating in the Talent Show. I also liked being able to pick our own activities like art and swimming. I liked being with my friends and worshiping God together. Least favorite part? My least favorite part was having to dance in order to get lunch! Did you learn anything that surprised you? I learned how to balance a feather in my hand. The trick is to look up at the tip of the feather and watch it. Do you want to go back to camp? Yes! What was your favorite part of camp? The blob [an inflatable on the water], parties and making new friends. Least favorite part? Going to bed early. Did you learn anything that surprised you? We learned a lot about being “ third.” Putting God first, others second and yourself third. Do you want to go back to camp? Yes! Every year. Offering a great selection of PS-12 classes. Note: Dates for sports camps may vary. Offered in June & July, fast track swim camps are two-week intensive camps designed to jump start student swim skills and are perfect for new swimmers and returning students who wish to brush up on their skills. Year round swim education programs offer eight levels, starting at 4 months old, incorporating self-save and learn to swim strategies. Class are capped at four students to ensure each child has maximum swim time and are 30 minutes long. Kids ages 3-7 can paint, create obstacle courses and experience yoga, dance & science. Weekly themes include superheroes, pirates & mermaids, tie dye & snow cones, pets, & more. Kids ages 7-12 can take part in an art enrichment camp. Projects are movie based using techniques by famous artists. Themes include Pokemon, Lion King, Toy Story, Secret Life of Pets and more. Spend your Summer Break at Artsy Rose Academy! Summer art camps are offered for 12 action-packed weeks and include drawing, canvas and watercolor painting, mixed media pieces, Disney, LEGOS and more. For ages 5-15. Half-day or full-day options available Monday-Thursday as well as Fun Day Friday camps and, new this year, night-time camps. Before/after care available. June 10-Aug. 8; $90-$250 Performing arts classes and camps for 18 months to 18 year olds. Theatre camp themes include: Treasure Trunk, Fairy Tale, World of Wizardry. Theatre production camps, musical theatre intensive and art camps also available. Dance camps themed around popular kids’ movies and TV shows. Before/after care and scholarships available. Offers a one-week choral music day camp for students entering grades 2-8. Students are taught by Canterbury Youth Voices staff in choral music technique and artistry and also have the opportunity to participate in breakout classes in other art forms. Before/after care and scholarships available. Come learn all about horses or expand your skills at Camp Cadence! Safe camp horses; no previous horse experience necessary. Indoor and outdoor riding. For ages 5-16. Before/after care available. Residential summer camp for children with developmental disabilities ages 8 to 18 to experience traditional summer activities. One-to-one camper to staff ratio. Before/after care and scholarships available. Day camps offered from 9 a.m. to 3:30 p.m. for campers age 5-13 to unplug and engage in outdoor education, build self-worth, confidence and interpersonal communication skills. Extended care is available from 7 a.m.- 6 p.m. Overnight camp is for campers 1117 years old. Scholarships available. Unmask your child’s creativity this summer in the all-new Camp Invention, where children transform their wild imaginations into epic creations. Campers in grades K-6 will code robots and use collaboration and creative problem solving during hands-on STEM activities. Use promo code PLAY15LISTING to save $15 (expires 5/10). May-Aug. 1; $150/week for 24 hour care Full time care for infant through age 12 as well as short-term dropin options. Summer programs for school age children include field trips, educational tours, art classes, crafting and more. Locations: Acorn Children’s Center: 3601 N.W. 51st, OKC; Kindercastle Children’s Center: 309 Bizzell, MWC; Linwood Early Learning Center: 3034 N.W. 17th, OKC; Children’s Lighthouse 3 OKC locations: 540 N. Council Rd., 5816 N.W. 36th St., 6624 N.W. 63rd St.
Offering three-day overnight camps for ages 6-9; six-day overnight Outdoor Adventure Camps for ages 8-16; three-day day camp programs for ages 5-9; and Leadership Development and Kayak camps for high schoolers. Before/after care and scholarships available. June 1-Aug. 7 Camps available in a variety of topics such outdoor adventures like fishing, archery and kayaking as well as science, kids in the kitchen, sewing, photography and lots of art! Some camps are five days in length, others are shorter. For ages 2-15. Scholarships are available. Campers enjoy Biblically-integrated sport, academic and enrichment programs taught by Crossings Christian School teachers and faculty. For kids in preschool to 12th grade in Oklahoma City and the surrounding area. Dates for sports camps may vary; check the website for those dates. Week-long camps offered from 9 a.m. to 3 p.m. for ages 6-12 to learn how to brush, saddle and ride horses, with lessons taught by qualified trainers and safe horses. Other activities and crafts included. Before/after care available. This summer camp is specifically planned with students ages 6-11 in mind. No previous Taekwondo experience is needed. Camp will focus on a character quality and physical technique with games that reinforce flexibility, balance, accuracy, integrity, team spirit, speed, reflexes, self-control, indomitable spirit, power, footwork, respect and courtesy. Day camps with themes such as Secret Agent, Animal Planet and Cooking offered from 9-11:30 a.m. Monday-Thursday each week for ages 3 through 2nd grade. Developmentally-appropriate music adventure camp for ages 8 months to 8 years with exciting themes like glow in the dark camping, jungle jamming, barnyard fun and more. Parents stay with young children during camp. Multiple camps offered throughout the summer. Day camps are offered for girls grades K-8 on a weekly basis. Each week has its own theme and field trips to go along with it! Campers are picked up and dropped off at the Oklahoma City location. Resident camp offered for all girls grades 1-12. Among the fun activities are horse caring and riding, canoeing and ropes courses. Before/after care and scholarships available. Allows kids from ages 6-11 to spend five days exploring Oklahoma’s Territorial heritage, life on an 1880’s homestead, the relevance of the ‘waste not want not’ motto to all decades of Oklahoma’s history, as well as an appreciation for the museum’s 10-acre surroundings. Programming will take place in and around the 1897 Schoolhouse with programming in historic buildings throughout the week. Space is very limited, so register early to get a spot. Before/after care available. Classes fill up on a first come, first serve basis throughout the summer. Limited availability each week. Discounts provided for multiple children. Call to register today! June 3-June 28; $180/week Camps for children ages 3-11 available in four sessions with various themes. Each one-week session meets daily from 8:30 a.m. to 2:30 p.m. Activities include robotics, art, nature, exploration, culinary skills, invention and more. Before/after care available. Young Company Treasure Island Peter Pan Beauty and the Beast The School Play. A farce. CAMPS Epic Adventures Summer Camps May 28th - August 15th, 2019 Summer Camp enrollment is now open! locations in Choctaw and norman! GO TO OUR WEBSITE FOR DETAILS! Summer on the Farm is a kid’s summer dream come true! Campers entering kindergarten through 5th grade can enjoy fishing, kayaking, a creek for exploring, sandboxes, gardening and caring for farm animals. Options available beginning the last week of May and continue through mid July. Registration accepted until maximum enrollment is reached. Theatre camps for ages 7 and up, including opportunities for: 101 Dalmatians production camp, James and the Giant Peach production camp, Junie B. Jones Jr production camp, technical theater camps and one-week training camps. Some sessions require an audition; see website for details. Before/after care and scholarships available. Mondays @ Metro are one-day gymnastics camps for boys and girls ages 4-10 featuring fun and exciting weekly themes and games. Campers get to exercise, enjoy a craft and burn energy with gymnastics. Ages 5 and up can stay and have a blast in one of the cartwheel or back handspring skill clinics. Classes taught by experienced art educators for ages 3 through 18. Options range from primary art camps with parents to theater, painting and illustration lessons for older kids. Scholarships available. National Cowboy & Western Heritage Museum 1700 N.E. 63rd St., 405-478-2250 www.nationalcowboymuseum.org June 1-July 31 The museum is offering day care/day camp summer break specials. Visit the National Cowboy Museum for a fun, interactive experience with your children’s group. Select from several exciting programs designed for kids ages 4-12 or choose a self-directed tour. One-week advance reservations required; space is limited. Group admission rates apply. Call (405) 478-2250 ext. 241 to schedule your group. $30/child 9 a.m.-noon or $65/child from 9 a.m.-3 p.m.
New View Oklahoma 501 N. Douglas Ave. 405-250-6279 www.nvoklahoma.org June 23-28 July 19-22, $50 Participants grades 3-8 who are blind or visually impaired will have a one-on-one buddy for a week filled with “adventurous” activities. Enjoy rock climbing, indoor ski diving and so much more. Kids ages 14-17 can be volunteer buddies. Scholarships available. Children ages 4 years through 6th grade may participate in basketball, cheerleading, soccer or Team 45, which teaches kids ages 4 & 5 the fundamentals of motion, rhythm and balance all while experiencing God’s love. Spots are limited. Scholarships available. Creativity in the visual arts is fostered and embraced during the Children’s Summer Art Program. Five different sessions available for three age groups: 5-6, 7-9, and 10-14. All sessions meet 9:30 a.m.-11:45 a.m. each day. Visit website for class schedule. Scholarships available. Oklahoma Children’s Theatre 2501 N. Blackwelder Ave. 405-606-7003 oklahomachildrenstheatre.org May 28-Aug. 15 $120-$500/session Art camps guided by experienced teaching artists to inspire campers to make their own masterpieces. Camp offered from 9 a.m. to 4 p.m. for the following ages: 6-7, 8-9, 10-12, and 13-15. Before/after care and scholarships available. Oklahoma Contemporary 300 General Pershing Blvd. 405-951-000 bit.ly/OCsummer May 28-June 28 $200-220/session Five weeks of day camp/art camp experiences for ages 4-12 to explore creativity in every medium. Camp themes include monsters and superheroes, clay and costumes, poetry, dance and DJ’ing, robotics and much more. Before/after care and scholarships available. July 15-19 $130/OHC member, $150 non-member Oklahoma Junior Curator Camp is a fun and productive summer activity for students ages 8 to 12. Registration opens June 3 and closes July 10. For more information or to receive a reminder when registration opens, please email education@okhistory.org. Westminster School admits students of any race, color, religion, or national and ethnic origin. It does not discriminate on the basis of race, color, religion, or national and ethnic origin in administration of its educational policies, financial aid program, athletic, and other school-administered activities. OSU-OKC Cooperative Extension Services 2500 N.E. 63rd St. 405-713-1125 bit.ly/ocesflyer May 30-July 17; $10-$50/workshop One- to three-day workshops are held for ages 8-19 with subjects such as Babysitting 101, S.T.E.M., Financial & Job Readiness, Kids in the Kitchen, Sewing, Jr. Master Gardener, Food Showdown, Healthy Living for Kids and 4-H Project Camp. Scholarships available. Horse Camp makes friends for life! Oklahoma Swim Academy 14701 N. Kelley Ave., Edmond 405-509-5415 www.oklahomaswim.com $60-$400/month Oklahoma Swim Academy teaches all ages a love of safe swimming, offering Parent-Tot classes (4 months-24 months), Survival Swim Lessons, SwimFloat-Swim, Stroke Development and Adaptive Aquatics Programs. Summer horse camp is a great way to get your kids outside and enjoying all the healthy activities that our equine partnerships offer. Plenty of fun, learning and lifetime friendships are just a few of the benefits! Space is limited, limited find out more at our website and get your reservations in soon! VISIT OUR WEBSITE FOR 2019 CAMP DATES! June 3-July 25; $79/camp Now in its 17th year, Rose State continues to offer a variety of summer camp opportunities to build children’s imagination, creativity and knowledge. Kids College is designed for children going into grades 1-6. The Teen Scene program is geared specifically for preteens and teens going into grades 7-10. Sample subjects include Aerospace Discovery, Archery, Candy Chemistry and Cartoons, Comics & Manga. Sam Noble Museum 2401 Chautauqua Ave., Norman 405-325-4712 samnoblemuseum.ou.edu May 31-Aug. 2; $10-$325/session Summer Explorers classes are one-day camps or week-long camps for children ages 4 to 11. Camps run Monday-Friday and the majority are two-hour sessions and full-day sessions. Participants get to experience science first-hand in classes such as Creepy Crawlies, Dinosaur Detectives and Grossology. Scholarships available. June 10-July 18 Prices start at $72 Summer camps for ages 3-11 in themes like Fancy Nancy, Disney Pop Star, Lego Ninja Hip Hop, Barbie Ballet, Jojo dance party and Princess & Prince camp. Dance classes also offered for ages 2-18. Scholarships available. The Studio of The Sooner Theatre 110 E. Main St., Norman 405-321-9600 www.soonertheatre.com June 3-Aug. 2; $125-$475/sessions Multiple sessions of theatre camps for performers of all ages to learn new techniques, build character and get comfortable on stage. Scholarships available. Thunder Youth Basketball Multiple locations: OKC, Edmond and more May 30-July 31 okcthunder.com/youthbasketball youthbb@okcthunder.com Lock in your spot for one of 12 camps for boys and girls ages 6-14 taught by certified Thunder Youth Basketball Coaches. Limited availability; register early. TechyKids OKC 9500 N. Pennsylvania Ave 405-673-1203 www.techykids.com June 10-14 & July 15-19 Early Bird, $375; $425 after 6/1 Learn robotics, coding, design and 3-D modeling. Kids ages 7-12 years can create their own technology-inspired projects. The projects and tools are catered to each campers skill and age level. Utilizing a unique personalized learning system, kids of various ages are able to be in the same camp. Participants are paired with a peer of similar ability level or paired with campers who are comfortable working together. Tiger Safari’s Interactive Zoological Park 963 County St. 2930, Tuttle 405-381-9453 tigersafarizoo.com June 4-7 & July 9-11 Safari Camp provides an immersive, educational experience in a unique setting. Campers create a deeper connection to wildlife as they perform hands-on, minds-on exploration of nature, sciencebased investigations in the Zoo’s living laboratory, have up-close experiences with the Zoo’s animal ambassadors and have fun learning about animals from around the world. Campers ages 4 to 14 are welcome. Activities are age and grade-appropriate, and themes change regularly for an always-fresh experience. Offers reading, language arts and math classes as well as individual and group reading therapy for kids in kindergarten-12th grade. Register by May 24. Weekly Monday-Thursday cheer and tumbling camps for ages 6-18. Campers learn from expert teachers. Camps meet for two hours each session. Scholarships available. Join us this summer for themed classes and pop-up camps! See website for details. Think Outside, No Box Required! YMCA Summer Day Camp is a place where kids discover not just the wonders of day camp, but the joy of exploring their unique traits, talents and interests and the power of sharing their strengths and skills to benefit the group. Camps available for kids ages 5 through 13. Financial assistance is available. Registration forms available at their website. Enroll for Summer Camps! Multiple weekly camps for ages 4-16 will be held June-August. $95/camp. Half-day sessions: 9-12 p.m. & 1-4 p.m. These attractions offer special summer activities to kids and families. Andy Alligator’s Fun Park & Water Park 3300 Market Place Dr., Norman 405-321-7275, www.andyalligators.com May 11-Sept. 15; $16.95 Featuring more than four acres of aquatic family fun, Andy Alligator’s Water Park is the perfect place to beat the heat this summer. Two new attractions, the Wipeout and The Sling Shot water inflatables, add to the fun of all the other water rides and slides. Every Friday in July, all Fun Park attractions are just $5 each including go-karts, bumper cars, Frog Hopper, Rock Wall, Kids Zone, Batting Cages, Mini Bowling, Gator Golf and Laser Tag. Chickasaw Cultural Center 867 Cooper Memorial Dr., Sulphur 580-622-7130 www.chickasawculturalcenter.com One of the largest tribal cultural centers in the country, the Chickasaw Cultural Center shares the unique history and vibrant culture of the Chickasaw people through cultural demonstrations, art, exhibits, films and special events. Special summer activities offered; find details on website. Dust Bowl Lanes 421 N.W. 10th St. 405-609-3302 www.dustbowllounge.com Fun retro bowling alley that is open additional hours for summer. 11 a.m.-8 p.m. Thursday-Sunday, 4 p.m.-8 p.m. Monday-Wednesday for families with children. Myriad Botanical Gardens 301 W. Reno Ave. 405-445-7091, www.myriadgardens.org June 24-Aug. 9, Monday-Friday, 10amNoon; Suggested donation of $2 per child Drop in to enjoy fun, weekly walk-up activities that explore the world of plants. Daily themes include Make-it Mondays, Tasty Tuesdays, Reading Wednesdays, Think Green Thursdays and Find-it Fridays. Bring a picnic and towels and play in the Thunder Fountain for free afterwards. Groups of 10 or more, please contact Lily Christman, at 405-445-5162, for more information about group activities. Oklahoma Hall of Fame Gaylord Pickens Museum 1400 Classen Dr. 405-235-4458 www.oklahomahof.com Every Thursday from Memorial Day to Labor Day, families can enjoy a story and craft with free admission. Story time begins at 10:30 a.m. and is followed by a craft and summer activities to enjoy together. Skate Galaxy OKC 5800 N.W. 36th St. 405-605-2758 www.skategalaxyokc.com Enjoy day skate sessions 11 a.m.-2 p.m. on Wednesday through Friday from June 5 to Aug. 9. $6 per skater (includes basic skate rental). Family Nights are held on Thursdays, 7-10 p.m. $6 per skater (includes basic skate rental). Purchase a summer pass for $40/person and get unlimited summer day skate sessions (includes basic skate rental; not transferable). Tiger Safari’s Interactive Zoological Park 963 County St. 2930, Tuttle 405-381-9453, tigersafarizoo.com April 20, May 18, June 8, July 6 & Aug. 3 $20 per person You and your companions can go on a cozy walking adventure in the company of an expert guide. Hear insider stories about the animals or ask burning questions you might have about wildlife. Afterward roast marshmallows by the fire. All the fixings provided, and maybe be even a movie! Safari Night Out includes admission and monkey and deer treats. Enjoy special Zoo Day events, owl pellet dissections, Adult Forensics Nights, Jr. Forensic classes, and homeschool programming plus free scavenger hunts & prizes! Discounted group rates available. Classes and events offered weekly. Registration can be completed online at their website. Clay HandBuilding Workshops offer a variety of projects including Father’s Day gifts, coil pots, wind chimes and more. The clay pieces will be completed during the two-hour workshops and campers can return any time to paint the project. All steps are included in the cost of the workshop. SI N GI N G, FUN , AND FR IEN DS! V ISIT CA NTER BURYOKC.COM FOR M OR E INFOR M ATION! Register online now at GingersMusic.com! Shiloh Camp, serving inner city youth with the love of Christ through sports, arts, and meaningful relationships. NOW ENROLLING for 2019-2020 classes. Got a tight schedule? Need a certain night? At Territorial Fun Day Camp, ages 6-11 will have fun exploring Oklahoma history through games, crafts and other activities. April Showers Mothers' Day Flowers Handprint Plate Special Salad Size - $19 Dinner Size - $24 All that is needed is a handprint and we do the rest! Allow 10 days. a walk in the Plaza District and there was art on a wall with a three-eyed fish. My Mom took me to eat red velvet cream pie at Pie Junkie after the show. The stores nearby have aliens and sugar skulls and cool things. The theatre is like that too. You can find art in there made by real people right in front of you; they pretend and it’s a kind of art with costumes and music. Seeing Curious George was the best part of my weekend. I know he wasn’t real because I’m 7; that’s a man, not a monkey, but I kind of want to keep thinking he was the real George. Kids are creative and they’ll see how other people can be creative too. Would this experience be enjoyed by your siblings? Why or why not? My younger brother, Gabriel, is 4 and he thought the monkey was really George. Younger kids don’t really understand that the actors are just pretending but they like to go anyway. I saw some babies there but we didn’t bring our baby. My oldest brother, Sam, is 11 and he really likes plays. You can be in a drama club in middle school and he’s in that. book “Short” by Holly Goldberg Sloan, which is about “The Wizard of Oz” and a little girl who goes to theatre camp to be a Munchkin. I would like to do that and now I know you can do that at Lyric Theatre but I would like to see kids instead of adults after they go to the camp, like what they can do. It kind of helps if you know the story already and I know “Curious George” from PBS Kids and from some books. Maybe I’ll know the next story I see the play of if I go again sometime. It’s like this musical called “Hello Dolly” that I made my Mom take me to last year because I kept seeing commercials for it on TV. I really wanted to see that but I was totally lost on the story. I didn’t get it but watching the people dance was still fun. What do you think you’ll remember most about visiting? I’ll remember the whole day! Pie helps you remember. Seeing a play is something every kid should do. ISAAC’S BROTHER, GABRIEL, AT PIE JUNKIE. Find more Kid Reviews at www.metrofamilymagazine.com/kid-reviews.